MONOCIRCUS' original t-shirts in kids' size. Screenprinted and embroidered by hand in fine details on 100% cotton white tees. a unique design based on the imagery of circus elephants graphically modelled in 3 dimension. this new year festive period, MONOCIRCUS has some new items uploaded. rings, brooches,t-shirts, as well as bags from kaeken. Be sure to check them out! 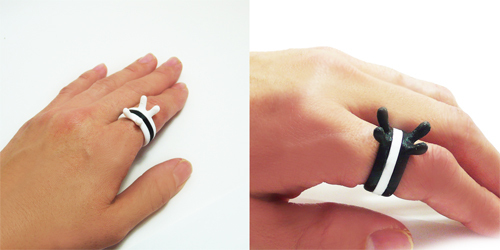 3D printed ring, "ROW" the white version and "ROB" the black version. original metal clasp bags in stripes, orange and grey variations.